Continuing our University previews, Andy Eck takes a look at the still-developing (and oddly named) West Midlands and Wales region. This region is small, still finding its footing among the more established Ultimate teams of England and Scotland. The most powerful squads hail from the English half of the region, while teams still in development find their home in the Welsh half. While often overlooked, give this region five years and it’ll be as diverse and hotly contested as any. For now, shake ups among the six universities are rare and the big players dominate the scene. Andrew Moss starts off the University Outdoor season from the Western region perspective. Always challenging, the run up to the University outdoor season seems to have been particularly tough this year with the addition of flooded fields and 80mph winds meaning it has been nearly impossible for teams to get outside. Those who have persisted will be rewarded, however, with the opportunity to represent their University at the BUCS National Championships. Ben Powlay in blue for Plymouth University. Photo courtesy of Andrew Moss. 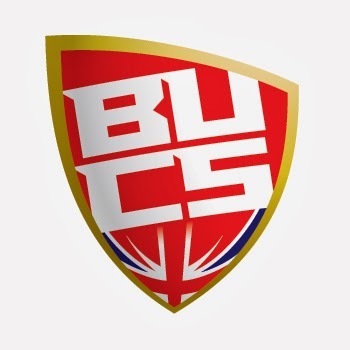 The South Bristol Sports Centre will host those Western University teams hoping to make the elusive top six in our regional competition, and thus a spot at Nationals in Manchester. An expanse of quality, well-drained fields means the tournament has a huge capacity, and clubs have taken advantage of this with most fielding second and third teams. Some fairly exposed pitches means that wind will likely be key factor in this tournament. Southampton consistently make the final in this division, but last year a determined Bath side meant they had to settle for second. A strong Nationals saw them placed as the highest Western team and sixth in the country. Bring his experience from European competition, William Caldwell (Ka-Pow!) hopes to captain Skunks back to first place, and looks forward to his team playing a quick offence with isolated cuts. Big plays are likely to be featuring GB u23’s Mike Speer and up-and-coming rookie Joe ‘Beans’ Benians. Predicted to join them in the final are defending champions Bath. They have a star-studded team of GB and Jen players hoping to retain that top spot. Alex Brooks (Jen captain), will have been enforcing his club team’s ethos of elite athleticism on this university squad, which combined with already experienced players Piers Nicholas (GB u20), Michael Guise (GB u20) and Andy Watt (Jen), this is going to be a powerful team looking to retain their spot in Division 1. Watch out for Danny ‘Jumps like a Salmon’ Ryle (Reading Ultimate) leaping over people in the end zone. Bristol placed in fifth last year, but beat Bath at indoors so are going into the tournament confidently and with eyes on that Division 1 spot. Josh Kyme (GB u23 Open, Chevron) leads a team relying on their athleticism from a standard stack play. This team includes solid handler Joe Brown, who missed the indoor season with a string of injuries and returns to the firsts in a blaze of outdoors glory. With James Bogie (Mythago’s ‘Most Charming Man’), Jamie Lowe (Mythago’s swimsuit calendar ‘December’ 2013) and Ollie Towers upfield, opposition will have a hard time containing the flow these quick guys can maintain. However, translating indoor success to outdoor victories isn’t an exact science, and if the weather turns nasty, it remains to be seen if Bristol have the depth of handling experience needed to deal with the difficult conditions. Perhaps a controversial prediction is for Exeter to miss out on that Division 1 spot. Despite edging a final victory in Open Indoors at the end of 2013, the absences of Tom Cartwright (Chevron, GB u23) and Rhys Evans (Chevron) means this regional tournament could be a struggle. Squad depth will be tested as inexperienced players have to step up to the first team, some in their first ever tournaments for the University. Don’t underestimate this team however, as under the captaincy of Rob Vile (Devon) and backup from Greg Mann (Devon), this team still has a wealth of ability and will be fighting for those top spots. Picnic have had a strong season so far, and look likely to comfortably take one of the Division 2 places. Captain Ben Powley (GB u23, Chevron) has unleashed his tactical creativeness in the form of some special offensive plays, including what might appear to the layperson as ‘running around a lot and seeing what happens’. A large addition of freshers to the firsts is likely to make this a volatile team where anything could happen. We’ve been warned to expect a team of ‘mystery and wonder’ who will be trying something different. Last year saw Cardiff take third, although current form puts them as only an outside chance for taking that Division 1 spot again. However, after an indoor season focusing on player development, this team promises an unpredictable tournament as they move into their preferred outdoor domain. Kei Matsumoto will be leading the plays as usual, with a solid base coming from experienced players Mike Walter and Alden Ching who offer solid handling when required. 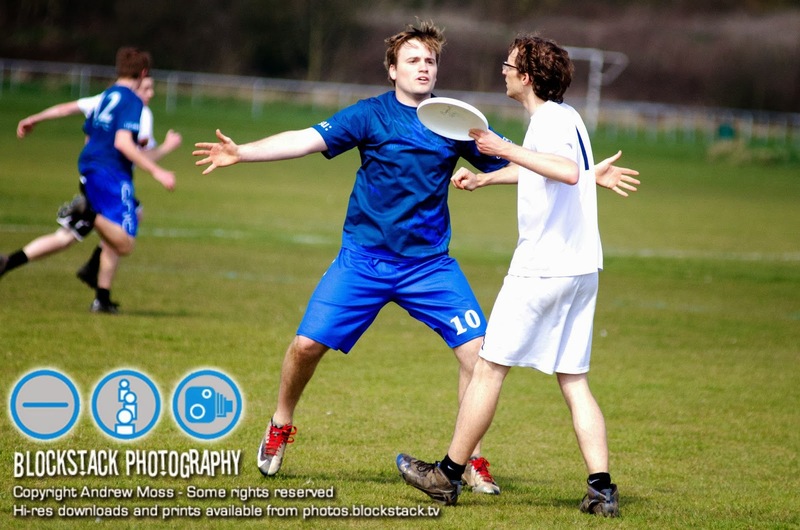 It is the influx of freshers who may have the largest impact on Cardiff’s standings – Dan Rowland and Ollie Crowther have showed promise on D, and if Cardiff’s outdoor focus this year has paid off, we can expect big things from these rookies. Swansea have had a fantastic season so far, making Indoor Nationals in both the Open and Mixed divisions. They are hoping to see similar success outdoors, after missing out closely last year. Ben Yarnold (BAF) continues to lead the team, implementing a new playbook for 2014 which is likely to utilise Jacques Laloë’s (Brighton) pinpoint hucks and Matt Bolton’s consistency and experience. A team which has primarily been associated with the social side of the sport, they’ve demonstrated this year that they can put their heads down and cause some big upsets. Expect a good game-to-go on Sunday afternoon. Seaside team Bournemouth has come a long way since their starring role in the ‘World’s Most Mediocre Callahan’ video this time last year. Captain Mark Shepherd has had an influx of fresh talent to choose from, in addition to some legacy returning players he hopes won’t be too much of a liability. Historically around the seventh place mark in this competition, making Nationals only once since the team was founded, Bournemouth will want to make a dent in some of the top teams and squeeze into that last Division 2 spot. Rapid fresher Henry Pym will be showing his youthful enthusiasm for the disc, whilst Will Burton’s stamina will only be matched by his side-line heckling. Finally, Winchester have entered Uni ultimate with a very large club considering their infancy. Two teams at Mixed Indoors and showing solid standings from their first team, they will be in contention for those Nationals spots in future years. Phil Rowlandson captains the team to their first ever outdoor regional event, accompanied by familiar face Robin Younge. A strong contingent of freshers complete the team, who are already starting to make impressions at club indoor nationals and the GB junior trials. Expect a lively game from these guys, who won’t just roll over and give you an easy win. More from other regions soon! Kathryn Elsby from Southampton Skunks has provided us with the preview of Western Women’s regionals. First up is Cardiff No Frills. With three teams entered in regionals this year, it is clear that Cardiff Women’s Ultimate is going from strength to strength, and looking to go for at least one of those places at Nationals. The teams have different aims, with firsts aiming for nationals with a wealth of experienced and fresher players alike, and seconds looking forward to a competitive weekend. Many players in the third team will be experiencing their first tournament, building bonds and focussing on individual strengths. Cardiff are looking forward to facing up against Uriel and Bristol, with plenty of friendly rivalry and close games in store. Ones to watch on the first team include Heather Scullion and Dina Dent with big grabs and lots of experience – although the team as a whole is looking pretty formidable. Next up are Exeter Ultimate. Uriel have also entered three teams into the tournament, which shows their success as a club and their drive to get as many players involved as possible! A strong performance by their first team at last year’s regionals means they will be hungry for a repeat performance this year, with eyes on that Nationals spot. With experienced players in all three teams, things might not be as clear-cut however with some potential surprises on the way. Exeter are looking forward to playing most teams but especially Cardiff and Bristol, with high intensity and challenging matches in store. Players to watch include Katie Hall of GBU20, Eyan Sham with 5 years experience, and international player Molly Norrbom. Defending regional champions Bath are up next. Seeing this year as more of a development year, Bath are looking for the chance to build their women’s team and give their freshers plenty of experience. Look out for some strong and athletic freshers showing some solid performances. With their traditionally very strong zone defence and ISO offense, it will be exciting to see what Bath have got in store for us this year. The return of Bristol shows a team of returning players and new faces alike, with Mythagirls aiming to better their fifth place finish last year. They are looking forward to playing new teams such as the likes of Swansea, and familiar faces such as Cardiff with whom they played with at Outdoor Nationals, and Skunks (although this may just be for the amazing call of Bunny Bunny). Captain Rachel Naden and GBU20 Amy Samson bring a lot of experience to the team, making a fantastic handling pair. A solid group of freshers will also be looking for plenty of run through Ds. Finally, we move on to Southampton. Skunks are using regionals as a chance for freshers to build on what they’ve learnt at Skunks Beginners tournament/SICKO, but with an incredibly strong fresher intake and a core of experienced players who have played together for a few years, they will be looking to grab a place at nationals. They are looking forward to playing Bath as a re-match of last year’s final, and also Cardiff for a competitive, well spirited game. Keep an eye out for the super speedy Hannah Gilchrist, GBU20 player Kathryn Elsby and Brighton tour player/4th year Megan Baxter for some big throws and breaks. More to come from WIR! DP & JCK @ tSG.